Normal Mode: You are provided with a morse code sequence (both the visual and audible representation) and are expected to type in the correct word in time. Reverse Mode: You are provided with an alphabetic sequence or a word, and are expected to tap the corresponding morse code. This lesson uses dictionary words instead of random letters. 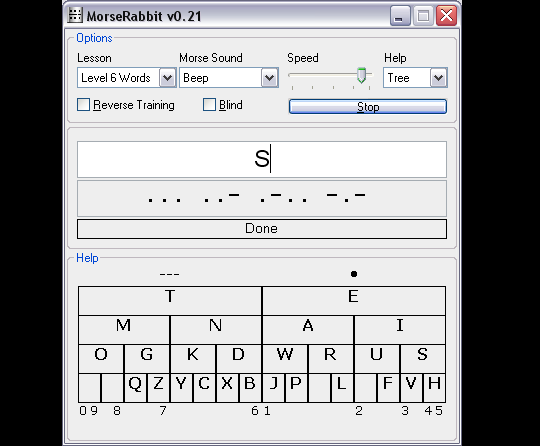 In these lessons you practice aspects of morse code that are beyond just knowing the alphabet. You can practice Prosigns (like the well known SOS), abbreviations and Q-Codes. If you have downloaded the compiled version, extract the ZIP archive to a new folder and run the MorseRabbit executable. To uninstall, delete all files. Stop the training if it is running. You may adjust the speed slider, to tell MorseRabbit how to listen to your taps. Make sure the Reverse Training checkbox is clear. Now, type the letters representing the morse code you hear. Make sure the Reverse Training checkbox is checked. Now, use the spacebar to tap the morse code for the letter. Short press for a DIT, long press for a DAH. Pressing backspace, left arrow or delete, will mark the word as failed. 784 1,690 Danny Ben Shitrit <img src="https://www.oldergeeks.com/downloads/gallery/thumbs/MorseRabbit1_th.png"border="0"> May 12, 2018 - 13:00 0.21 Unknown ZIP , out of 13 Votes.